Product #60519 | SKU 6-806 | 0.0 (no ratings yet) Thanks for your rating! 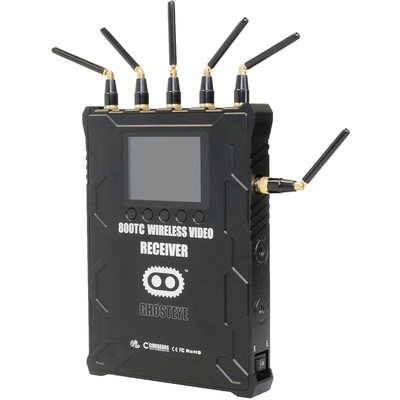 The Cinegears Ghost-Eye Wireless HDMI & SDI Video Receiver 800T.Code pairs with any Ghost-Eye transmitter and accepts uncompressed, 1080p60, 10-bit, 4:2:2 video from up to 2,600' away with less than 1 ms of latency (depending on the transmitter). It operates on the licence-free 5 GHz frequency band. It also features tally and talk-back functionality and timecode support. The receiver has both HDMI and SDI outputs and is capable of cross-conversion, whereby an HDMI input can be output via SDI or vice versa. Small obstacles in the line of sight are compensated for by an adaptive signal logarithm keeping your signal connected. For safety, signals dropped due to interference or loss of line-of-sight are automatically reconnected within 1 ms of the obstacle being removed. The receiver comes with a V-mount battery plate.